Mountcastle and Stewart got the Tides on the board in the third inning, with the duo belting back-to-back homers leading off the frame. It was the first time the Tides have hit back-to-back round trippers this season, with Mountcastle's blast being his first home run at the Triple-A level. The Tides trailed the contest 6-4 entering the sixth inning, but Norfolk sent 10 men to the plate and registered seven hits in the frame to take a 10-6 lead. All seven of Norfolk's hits in the inning were singles, including two-run knocks from Mountcastle and Mason Williams. Stewart and Anderson Feliz also added RBI singles in the inning, with Feliz accounting for two of the seven hits as the Tides batted around against Colin Poche (0-1) and Hoby Milner. Mountcastle, the #2 prospect in the Orioles system according to MLB.com, has now hit safely in four of his last six games, batting .308 (8-26) with seven runs batted in over that span. 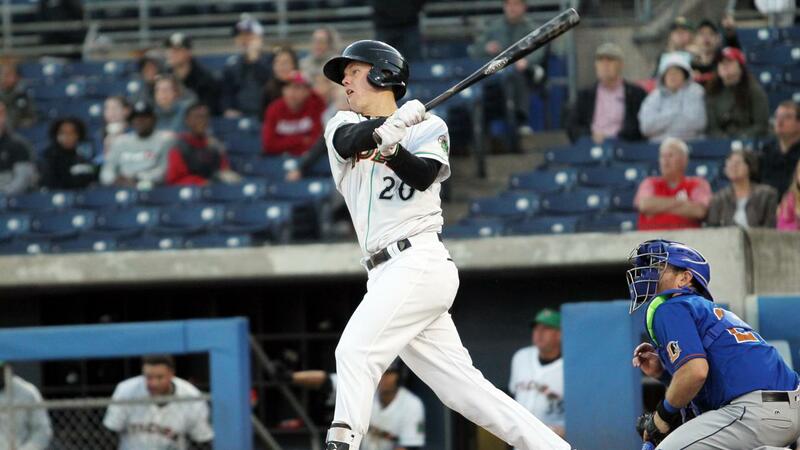 Stewart, rated as the #16 prospect in the Baltimore system, has now belted three home runs through 11 games thus far. A first round pick out of Florida State in 2015, Stewart has posted a team-best .426 on-base percentage this season. Matt Wotherspoon (2-0) earned the win with three strong innings of relief, striking out five over three hitless innings of relief. Wotherspoon worked around three walks in his outing and now sports a 1.93 ERA through four appearances this season. Josh Rogers did not factor in the decision after allowing six runs on seven hits over four innings of work. Making his first appearance since being optioned to Norfolk from Baltimore, he walked two and struck out three while throwing 51 of his 81 pitches for strikes. The 10 runs and 13 hits registered by the Tides set a season-high, and Norfolk has now won three of its last four games after opening the year with a 1-7 record. The two clubs will continue their four-game series on Tuesday night at Harbor Park, with first pitch slated for 6:35. Gabriel Ynoa (1-0, 4.91) will make the start for the Tides, with airtime on ESPN Radio 94.1 set for 6:30 pm. Notes: Stevie Wilkerson singled three times in the contest to up his average to .297…Lucas Long struck out one over two shutout innings to wrap up the win…Norfolk went 8-for-17 with runners in scoring position…Mason Williams had two hits and has now hit safely in five of his last six games, batting .400 (8-20) with six RBI over that stretch.